This section is for members to report back their recent rally experiences. Another early start had the team watching the sunrise as Alan, Denise and Tony headed down the M1 for another day on the RallyUK club fields. A quick chat with the organiser and we slipped the car round the back of the field into a handy little lay-by and set up for the off. As we watched the main group entering from the main entrance, Tony lifted out the first coin of the day; a 1941 George VI farthing, the type with the little robin on. Full of enthusiasm, the group set off to see what else they could recover. Alan was soon to be rewarded with one of the items from his wishlist; a pretty little dress hook fastener from the 16th century. As our team moved around the field, two of the younger members of the local club where busy uncovering a bronze age palstave axe not too far from our intrepid trio's car! Initially, finds were rather thin on the ground. But by lunchtime the field had started to warm up a little with several buttons and the usual suspects. Over lunch, our team discussed the snippets of news that had been gleaned from the other detectorists on the field. Not only had an axe been uncovered from close by the car, but a Colchester brooch had also made an appearance. As they talked, it became obvious that the news was spreading quickly as the previously quiet corner of the field started to fill up with the beeps and buzzes of our local colleagues' and their equipment. Not to be outdone, the coffee and sandwiches were soon devoured and our team were off again. Within minutes, Tony unearthed an early fibula, spring still intact but the pin unfortunately long gone. A quick mid-field brief and the team performed a quick search of the immediate area for any more signs of our Roman friends. No such luck however but a nice little distraction anyway. By the end of the day, Alan had clocked up the dress hook, a 14th-15th century buckle plate and a lead counter, Denise had rescued a trapezoidal lead weight, a fragment of a metal buckle from the ww2 era, and a marvellous cannon shell bullet. Tony had added a rose farthing to the mix and together there were several buttons, bag-seals and a couple of thimbles. All in all, not a bad days haul. Elsewhere, the field had yielded the Axe, three fibula and several hammered as well as a modern silver brooch. To top it all off, as we made our way back home, we were treated to a magnificent red sunset to end a perfect sunny day. Well, the date 10.10.10 was said to be one of the luckiest dates in history. Needless to say, there were many on the rally who came away with that perception. The day dawned and after the weathermen had been promising the Indian summer for the previous 2 days, the mist lifted at long last and a perfect sunny day was welcomed. The Venue was Rooksbridge, well into the Somerset levels and the drive up to the site along a single track with ditches filled with water, was reminiscent of the Bolivian high road, which was reputed to be the most dangerous in the world. At least the Bolivian road had places to pass - [or an edge to drop off!]. The fields were a mixture of freshly ploughed, stubble and pasture, so we chose to remain on the freshly ploughed one. Pretty soon reports of 3 hammered coins were spreading about the field like wild fire. Our first walk up the field produced several bits of lead and a lovely military button. The soil conditions and signals were great, and mnay a time we were pulling up small items [mainly rubbish] from below spade depth. On the return leg, a gorgeous pigeon ring emerged from the ground. Probably dated 1990. More rumours of more hammered coins were heard. The return leg, produced not a jot, so we adjourned for coffee and cake - whereupon the 4 guys from the car next to us, showed us their 3 hammered coins, the hat pin and several buttons. Well, that fired us up and after the kettle had whistled - which startled a few of the trainspotters around us - we were on our way again, this time much lighter as the day had warmed up immensely. One of the funniest sights of the day was when one of the organisers beckoned his mates, with some degree of urgency, to come and see what he had found -- a mass rush of people legged it over to him, whereupon he pointed to a stone shape object and said 'don't you think this looks like a dalek?' He was almost lynched! One of the most beautiful sights of the day was watching a heron in the water filled ditches, searching for food. Nature at its very best. By 4pm, we had had enough, a small pewter spoon handle was the only find, so we slowly made our way back to the car, passing 'the chef' who had found a silver ring. We said our goodbyes to the crew and then made our way up the M5, arriving home at 7pm - exhausted, but what a lovely weekend. A full rally report can be on the detectingwales website. Enjoy it. Well done to the club members who went to the Essex rally. Contrary to all the weather forecasts and Tony's justifiable prediction of 'hell and high water' on Sunday, the day dawned bright and sunny as we set off on an early start to Sawbridgeworth. After an uneventful journey and only a few spots of rain we arrived nice and early. Hearing that 'this was the field where the torc was found' my hopes were high, the sun shone, wet weather gear donned 'just in case' and off we set. Slight mistake here: wet weather gear and bright sunshine are not comfortable bedfellows. In fact, we were both grateful for a bit of shade. The field was a bit damp after a lot of overnight rain which meant a lot of mud ended up stuck to everything. The rain kept off until midday or so, when we had a couple of hours of wind and rain which made the field even more sticky. I though the Garrett had put on a bit of weight until Tony pointed out the soil attached to the bottom of the coil. My, after a scrape-down it felt like a new detector! Sadly the wellies weren't as easily cleaned off. Now I know why my legs are aching today; dragging around a kilo or two of mud per welly has taken it's toll on the leg muscles! Overall, finds were a tad sparse. We heard tell of a Victorian gold sovereign (or perhaps a half sovereign) and we saw a couple of Roman grots and a zoomorphic brooch, perhaps Celtic or Roman. Tony found a nice cut penny. I found a motley selection of buttons. Heigh ho. The major benefactor of the day, however, was the scrap bucket. If I ever meet Messrs Lee or Enfield (unlikely, I admit) I may tell them what to do with their .303 cartridges. We also found a lot of chewed up pieces of aeroplane, evidence of the wartime airfield proximity and a bit of dodgy flying I suspect. So after another quick coffee we set off back and the heavens opened. A good drive back, home by half six and Tony didn't seem to mind too much the bits of Hertfordshire brought home in his motor! Sunday 26.09.10 was a beautiful day at Isleham, Cambridgeshire, well it would have been had it stopped raining just once throughout the day!! 5 members of the club, had bought advanced tickets, earlier in the year, to support the work of the Rotary club of Cambridgeshire, who, in conjunction with RallyUK had organised the rally event. It was going to be a day to remember for a whole host of reasons. The advance party of 2, had set off the day before and having settled in for a quiet evening, found themselves thrust into the middle of a 'teenage rampage' - well a teenage birthday party in a local pub!! Next morning saw them arrive punctually, 20 minutes late, due to satnav problem - [well thats what they told us!!] at the rally site. It wasn't long before we were all on the same field together and Marlene, soon got into the hobby and found a lovely 19th century button. Husband Peter, not to be outdone winkled out a superb roman fibula [Garrett 250 does it again]. This find had everyone gasping with admiration, not least the finder. What a way to start their 1st ever rally. Well done to you both. week, soon found an interesting dome shaped object and a bent object which later turned out to be a Hanns Krauwinkel jeton. Alan responded with part of a Georgian shoe buckle, Tony meanwhile was actively digging some distance away. As the rain intensified and the motley crew made their way back off the field for lunch, Alan came up with a cut half long cross hammered of Henry 3rd, Dublin mint. 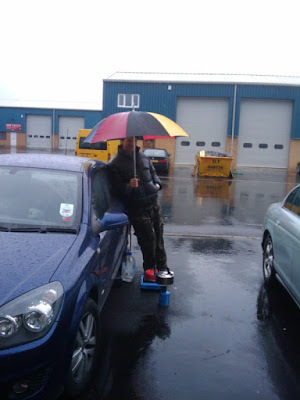 Back at the car, the kettles were soon on and whilst theo other 4 sheltered from the torrential rain, Alan bravely volunteered to hold the umbrella over the stoves, whilst Tony brewed the welcoming warm drinks for us all. Food was passed around, to help restore the energy needed for the 2nd half. We made our way back to the registration area, where we decided to tackle a different field. By this time we were soaked through, but there was still several hours detecting left. De came up trumps with a lovely lead button in the shape of a tudor rose, Alan got another Henry 3rd hammered, Tony excelled yet again with the Deus, bringing in the nummus and hammered coinage, along with thimbles galore - 4 to be precise! In the display cabinet back at site, was a beautiful anglo saxon sceat, for all to see. The FLO's were kept very busy indeed, with an ever constant flow of detectorists seeking refuge from the rain, [or was it the burger van that attracted them! ], handing in their finds for recording. The upside of the day was that 2 other local landowners were impresssed with the way the event had been organised and offered up their land for a rally next year. Rally Uk 19.09.10 -- - The Olympic result. NARCy and the 3 intrepid detectorists, Tony, Denise and Alan, set off at the unearthly hour of 7am, heading down the M1 towards the RallyUK club dig in Harlow, Essex. Little did we realise what a day it was going to be. Stopping briefly at South Mimms, so NARCy could flutter briefly in the strong wind, whilst the rest of us quick stepped towards the facilities, we were soon back on the road towards Harlow. On arrival, we were informed that the dig had been cancelled as the field had been seeded the night before! However, the good news was that another field on a promising site had been made available to us a couple of miles away. And what good news that was to turn out to be… So off we trundled, and being one of the last to arrive, we quickly set up our gear and entered the large field. Tony headed right and Denise and Alan turned left and it wasn’t long before Denise hits a stunning signal [at 9:30am] and pulls out her very first cut half hammered penny, [a William 1st 1066 - 1087]. She was dancing with delight, and nothing could disguise the sound of Tony’s pleasure as he congratulated her over the walkie-talkie. Little did we realise that this was to be the first of many coins for Denise that day. Soon she followed up with a George 2nd penny and then a half penny, in quick succession. So the couple continued to work the area closely resulting in Alan’s haul of Musket balls and buttons. Over in the other side of the field, wondering what all the excitement had been about with crackles of joy scratching over the airwaves, Tony had added a hypodermic cattle needle, a George V halfpenny and another cut half to the list. More musket balls and buttons, clasps and aluminium cans were pulled up but lunch was looming, so the team headed back to the rendezvous to put the kettle on. We met back at the car and we quickly commandeered an abandoned table on which we set up the gas stove, put the kettle on, got the sandwiches, cake and chocolate out. It wasn’t long before we were joined by the club organiser Cliff who, on seeing the superb spread before him, accepted our offer to join in. We showed him the finds and proceeded to announce to other detectorists nearby, about how the Northamptonshire mob had cleaned up the field between them. Tony’s cut half was thought to be Saxon (it was later positively Id’d to Henry I making it slightly later in the Norman period), Denise’s cut-half was later identified as a Scottish coin of William 1st, and Alan’s gold was identified as possibly being a piece of Viking ‘hack-gold’, a battle piece given to warriors to give them something to live for. The conversation turned to the afternoon session. Stories were told of how many of the best finds had previously been made in the last 5 minutes of many an organised dig. We laughed away, joking amongst ourselves and speculating how our last 5 minutes of the day would pan out, would it be more silver and gold or more cans and buttons?. Little did we realise that someone must have been listening! Suitably refreshed, we made our way back to the fields going our different ways. Buttons and aluminium were prominent signals, but Denise gets a very iffy signal and calls Alan over to check, a low sound emitted from the explorer, ensuring that it was worth digging and were we glad that we did. Well below spade depth, out popped a lovely silver pin with an acorn head, we jokingly called it a paper clip. But Denise had done it again, her 2nd piece of silver for the day. Tony meanwhile had been focusing down at the southern end of the field and had been recovering all sorts of goodies including a George III bullhead sixpence, a crotal bell and a very old looking pendant that may turn out be Saxon. As Alan and Denise made their way around the field boundary, they noticed a large group of detectorists all focusing in the one area, we later found out that they were recovering a large amount of Bronze fragments from axe-heads and other tools. By 3pm there were no more than a dozen people left on the field. So Alan and Denise decided to make their way towards the field entrance, meeting up with Tony, who speculated about what may lie ahead as we worked our way back. It was after all, getting close to the last 5 minutes of the dig. At 3.45 Alan was first up with a signal which turned out to be a lovely Military button, Tony had also started digging and successfully pulled out his first silver thimble, a little battered, but showing some beautiful decoration underneath the layer of dirt. But then it happened, dead on cue, at 3:55. As we turn away, Denise gets a signal, and there just below the surface was a coin, not any coin, but THE coin. A Celtic Bronze Potin from the Iron-age, which we later identified as having a celticised head of Apollo and a Bull on the reverse. This dated the coin to 100BC. We checked the find in with Cliff, who confirmed our thoughts and reminded us about our lunchtime conversation emphasising that he now knew for certain that the Northamptonshire team had definitely ‘cleaned’ up. As we avoided the massive traffic jam on the M25, detouring through London and around the North circular back to the M1, the journey passed quickly as we couldn’t believe the day that we had just had as a group, let alone the day that Denise had had, a commendable hat-trick of firsts: Her first hammered, her first silver pin and now her first Celtic. If that’s what happens when NARCy gets to accompany us on a dig, he’s sure going to be invited to every single one in the future. F.L.O. comment - "It's only the 2nd Potin i've seen in 2 years of doing the job." the day we went back to Ludlow. and all for about £7 you know. of finds to cheer us homeward. as the wheels sped round! Well, the day started in with heavy rain and the clouds never lifted all day. The only finds of note that were handed into the FLO for recording by the NARC were buckles and lead tokens. However the rally did produce a bronze age axehead fragment, a few roman coins, one hammered coin, dagger chapes, - but lots of lead tokens. We thoroughly enjoyed the day particularly when you read the report below that demonstrates quite clearly how detectorists and PAS are aiding the history of our land. Rob asked Teresa and I to decide on which we felt was the best, or most important find of the rally yesterday, Sunday. I just wanted to say thank you all for letting us come along. I know some people were a little disappointed that the Iron Age alluded them this time, especially after the last rally, but for us it was really interesting - especially with the flurry of finds at the end - which meant a few of you had to wait around to get your stuff back. Sorry about that and both Teresa and I appreciated that you had a long drive back to your homes - so thank you. 2. The Roman finds, although few were important, we know the Roman road runs across the edge of the village but this is the first time that Roman material has been found close to the village centre. We recorded no Roman finds last time so the two brooches and the coin are important and suggest at least 3 Romans (always pessimistic) cross the site between 60-120 AD and then again in the later 4th century, between 324-360 AD. 3. All the lead domestic stuff, I now this isn't the most exciting material - but the lead whorls and line weights mean real people living and working nearby - we think this is most likely to be between 1300-1600. There were a few belt mounts found as well as other personal artefacts from dress so people doing things. 4. The lack of hammered coinage still is odd, just a cut half of Henry III so either the people were poor, tight with their money or weren't about in large numbers. So why did I choose this, it is broken and battered and what some may call a parti-fact. But it was the oldest object found on the day and also it is really rather rare from Herefordshire. The PAS has only recorded 13 artefacts from Herefordshire dating from the late Bronze Age and only 7 of those are axes or axe fragments (4 of the 7 are from a single hoard so axes are really rather rare). So although it isn't pretty it is probably the most archaeologically significant find of the rally. I should say though that the button is really fine and in excellent condition being probably the best example that I have seen outside of a museum - it is probably a high status find and very similar to the hooked fasteners we see in this later Elizabethan and Jacobean period. The brooch is also important - this type of hinged dolphin with rolled spring cover is much more common in the central midlands and is rarely seen in Herefordshire and Wales. The most common are the sprung Polden Hill types which seem to be found on most Roman-British sites in Western Britain. The annual RallyUK rally near Harlow was once again a resounding success. The main detecting days were Saturday and Sunday, but with an open field for weekenders from 10am Friday and the 'free' detecting day on Bank holiday Monday, this year saw a total of four days detecting available to the 300 avid detectorists who attended. The light rain stopped on cue at 09:59 Friday morning and detecting began with an enthusiastic and energetic team entering field four. Within minutes, the first gold coin was reported, a George IV sovereign. This was to be the first of several gold coins to be found and by the end of the weekend, over a dozen had been reported and/or displayed in the marquee's finds cabinet including staters, half-guineas and other sovereigns. After a brief but comprehensive downpour on Sunday, (and lets not understate 'downpour' here) one of the detectorists who had been caught out in the rain with nowhere to shelter was rewarded with a half-stater surface find whilst walking back to the campsite. He received a signal from his detector, that he had been idly swinging as he walked, and looked down to see the little beauty simply shining back at him! Our friend from Suffolk went from drowned rat, to happy bunny, in the blink of an eye! From my side; a hammered long-cross penny on the Friday, a steady flow of finds over the weekend including roman bronzes and brooch fragments, and the new friendships that have been built, made for a very succesful weekend. Adjacent to last week's predominantly Medieval (but also Celtic and Roman) fields, the Rally UK team gathered at dawn talking excitedly about the upcoming Rally at nearby Sawbridgeworth next weekend. At Nine O'Clock on the dot, we set off into the new field in high spirits. We were soon to hear of the first major find of the day, being a Celtic quarter stater that had surfaced. Unfortunately, the finder then received a call and had to rush off to a job at work. Imagine the emotions of making such a find and then having to leave so early, he must have been gutted. Other finds from the day included several Roman and Saxon brooches, many "partefacts', and a selection of Roman coins. Five minutes before the end of the dig and a Saxon penny of Beornwulf (823-825AD) decided to make an appearance. We look forward to seeing some of you at next week's annual rally down in Sawbridgeworth. If you don't already have a ticket, I'm afraid it's already sold out, but make sure you book early for the next one in 2011.
were available to detect. The facilities were excellent with onsite toilets, food outlets and plenty of seating around. At first, the detecting was quite slow going, with the finds few and far between. The usual suspects of Georgian coinage showed up, plus a lot of lead shot. Around midday one of the loudest shrieks of delight was heard across the fields, one of our friends from the valleys had unearthed a beautiful James 1st 1604 sixpence. Lunch beckoned and a change of machine and detector head resulted in an increase of signals. It wasn't long before a George 2nd had emerged, followed by a lovely medieaval mount which i gave to the farmer for his grandchildren, who had come along to see what had been found. Another colleague showed us a gorgeous 2nd century denarius, and a small edward hammered. Then as the afternoon drew to a close, a very nice coin weight, which i think is from the James reign emerged, as we made our way back to the car. The artefact will need more research to confirm its ID. An excellent end to a beautiful days detecting. A good trip home followed.